1) Make the shell of the room (walls, floors, fixed lighting, etc.) as age neutral as possible. Kid’s likes and dislikes change as fast as the weather, it is better to have a beautifully designed shell and freshen things up with inexpensive items. 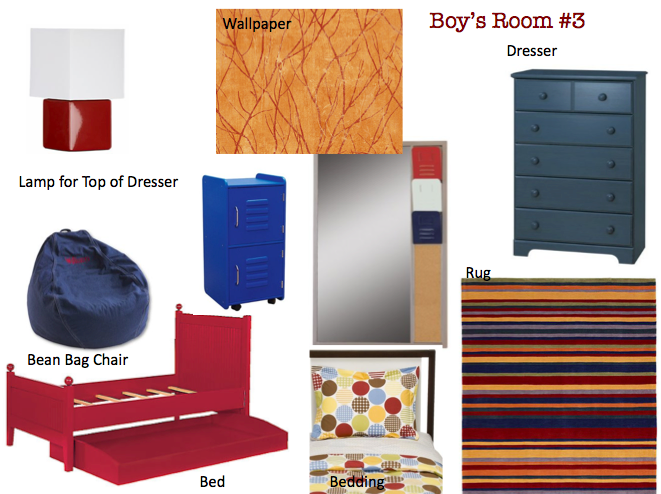 2) Invest in furniture that will take them from toddlerhood through the teen years. 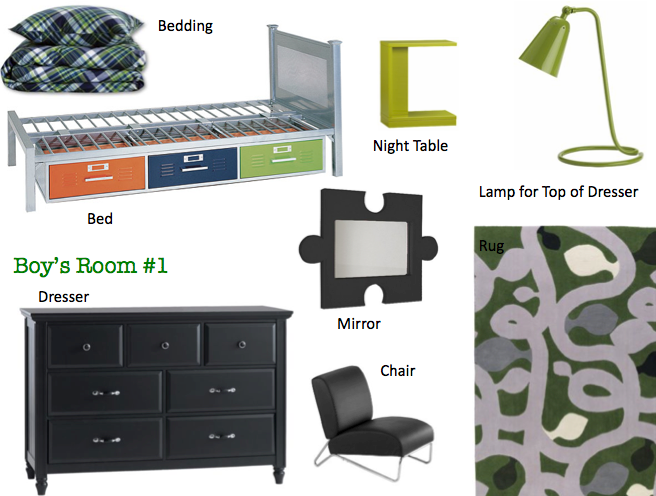 Quality dressers and beds will save money and drama over time. 3) Leave plenty of space on the walls for customization. This is a place where inexpensive posters and drawings can be changed as frequently as needed. If there was ever a place where chalkboard or corkboard walls are appropriate, its in a kids room. 4) Give kids a little say in what they want, but not too much. As I said before, their taste changes quickly. If you were to trick out their room with Star Wars or Sponge Bob or whatever else the kids are into these days, they would likely want something completely different in 6 months. Bed sheets are a great place to apply their latest fascination. 5) Finally, storage and safety are the always the first priority. I have a wonderful friend who has 4 boys under 10. Yes, she has the patience of a saint. To further test her patience, she and her husband put their house on the market 6 months ago (you know when we were in the depths of a housing crisis), and sold it within 12 days. So, they have been in an apartment, all 6 of them plus 2 dogs. They finally have an offer on a house that looks really promising. 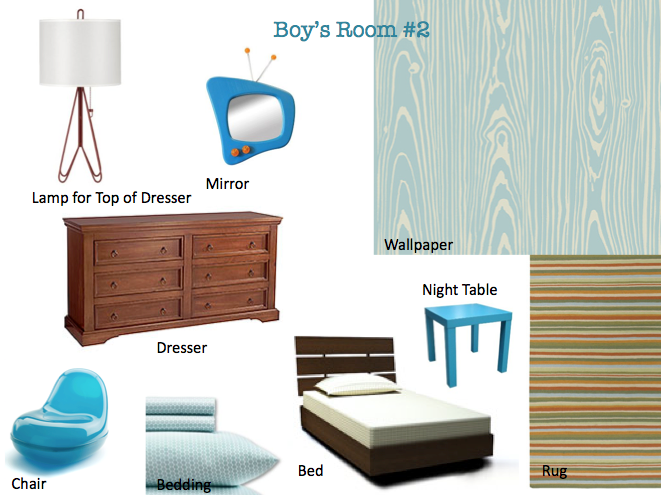 In hopes of creating some good mojo for them, I did a few preliminary design schemes for 4 new little boys rooms. 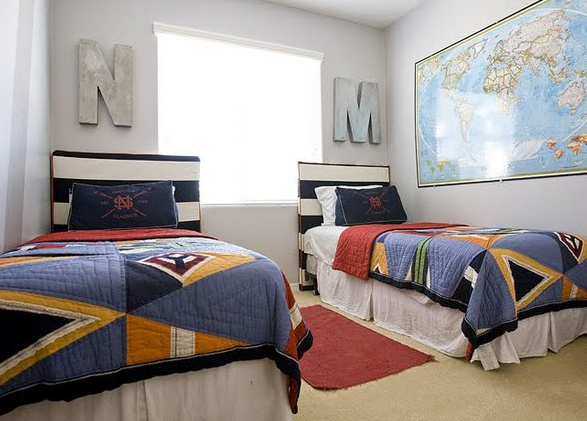 Sorry to leave out the little girls in this post, but my friend Raina did an awesome little girl’s room here. 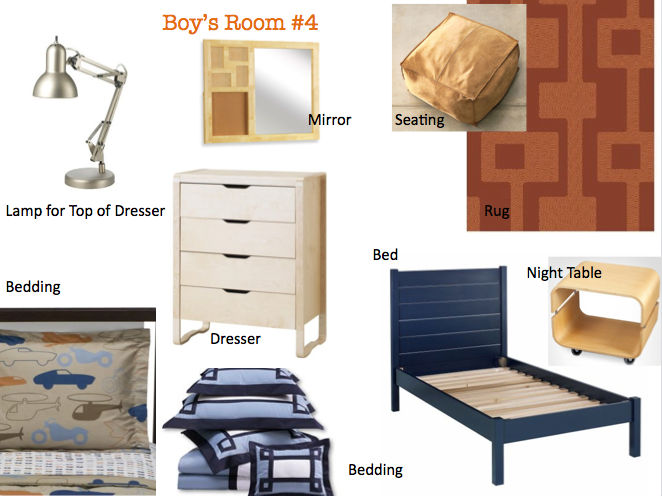 Please, people of the blogosphere, keep your fingers crossed for Becky and her boys, that they are in their new house soon and we get to start creating some amazing boy’s rooms. 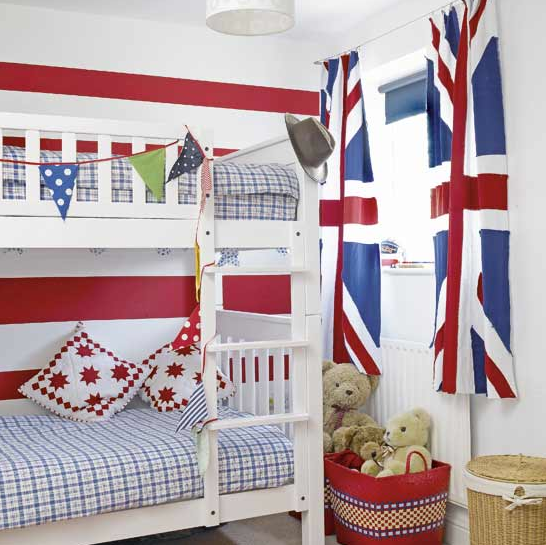 This entry was posted in E-design, Kid's Rooms. Bookmark the permalink.